You can win more friends with your ears than your mouth! Coming: 20th annual Revival class and seminar, Saturday Jan, 30th from 1:00pm till 3:00pm for all students and former students; lots of fun and door prizes!!! Sebastian joined our Black Belt school in September of 2015. 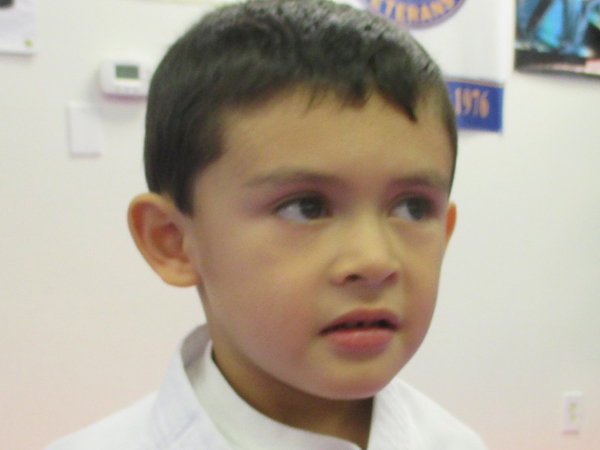 As a little dragon Sebastian enjoys all aspects of martial arts training and is very eager to learn. Always asking questions, Sebastian can be counted on to bring a smile and lots of energy to every class. Sifu Rick and staff are very confident that Sebastian will make a fine Black Belt one day with hard work and dedication. We wish to also thank Sebastian’s parents, Jose And Teresa, for all their support of not only Sebastian, but of our Black belt school as well. This is the time of year when it is very easy to take your eye off the ball or lose focus on the things that really matter. As the holidays approach and the New Year rolls in, it is easy to forget where our priorities should lie. Take some time to refocus yourself and reevaluate the things you are spending time on. First, deciding what is important and determining what matters is an internal decision process. We all have people in our lives who influence that decision, but ultimately you are the determining factor. You set the stage. You decide what is important and what is not. If you asked others “What’s important and what should I focus on?” you’ll hear a spectrum of answers as diverse as the people you question: family, work, education, friends, the list goes on. The intention of this article is not to help you determine what should be important (as the article mentioned before, this is an internal decision that can only be made by you), but we can offer some simple steps that should help you stay focused once you decide where your priorities lie during this busy holiday season. It seems obvious, but as the days pass by and events, special performances, and the holidays themselves happen, remaining organized will help you stick to your goals. To-do lists are key to staying focused. They act as a road map to getting important things done. This goes hand in hand with making lists. Keep on track and don’t let others manage your time for you. At first this may sound counterintuitive, but breaks allow you to recharge and catch up internally. And remember, staying focused is the key to accomplishment. Many people today take a multi vitamin to stay “balanced” or to make sure they are getting the proper dosage of vitamins and other crucial nutrients. However, have you ever really researched the recommended daily intake of each essential vitamin? When is the last time you checked to see if you are experiencing any vitamin deficiencies? If you take a multivitamin, you may be getting the recommended daily allowance (RDA), but it still may not be enough. In a typical multivitamin, you may get 1000 IU of vitamin D which is 250 percent of the current RDA. The problem is the latest studies are showing that more and more people are deficient in vitamin D, and some doctors are prescribing 5000–10,000 IU daily. Although bone pain and muscle weakness can both be symptoms of a Vitamin D deficiency, many of the more common symptoms are also more subtle. Low blood levels of Vitamin D have been associated with cognitive impairment in older adults, severe asthma in children, and an increased risk of cancer and cardiovascular disease. Research also suggest taking in more vitamin D can aid in the prevention and treatment of a number of other conditions, including diabetes, hypertension, glucose intolerance and multiple sclerosis. Vitamin D does not only support strong bones, but recent studies have shown Vitamin D may have many more benefits than originally thought. Below are some of the benefits that come with having the proper amount of vitamin D in your system. And remember, don’t self-diagnose; the only real way to know if you are deficient in this particular vitamin is by getting a blood test from your doctor. Vitamin D can affect as many as 2000 genes in the body. Vitamin D is vital in regulating the absorption of calcium and phosphorous and facilitating normal immune system function. Vitamin D helps with improved resistance to certain diseases. Research suggests that vitamin D also plays a role in reducing MS (according to a study in the Journal of the American Medical Association). It also decreases your chance of developing heart disease (according to findings published in Circulation) and helps reduce your likelihood of developing the flu (American Journal of Clinical Nutrition). Some studies also suggest that vitamin D may help prevent or reduce the risk of some cancers such as colorectal, breast, prostate and pancreatic. If you haven’t asked your doctor about vitamin D, you should. This vitamin may be more than we all thought and can possibly lead to a longer, healthier life.